Keeper® straps and ropes feature Hi-Test, abrasion resistant materials that exceed the needs of the most demanding situations. 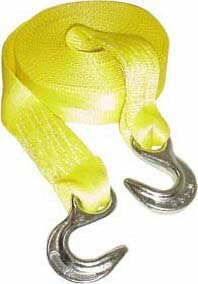 The zinc plated, forged hooks are specially designed for towing and attach easily to vehicle frames. A must-have item for trail goers. These Hi-Test web straps provide exceptional strength, are lightweight and easy to store and care for. The stretch and recoil action of recovery straps make vehicle recovery easier to work with.